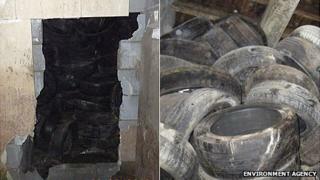 About 4,800 tyres were discovered behind a false wall at the Oxford Mill on Oxford Road in Burnley. An Environment Agency spokesman said officers had knocked down the wall after seeing the tyres through one of the mill's windows. He said an investigation had been unable to reveal "who was responsible for the illegal storage of the tyres". The inspection was carried out with the consent of the mill's new owner who had helped the agency, Lancashire Fire Service and Burnley Council "swiftly and safely" dispose of the tyres, the spokesman said. He said that the tyres had been "a significant fire risk, putting residents and businesses nearby in danger". "If these tyres were set alight, perhaps through vandalism or by accident, the fire would have been very difficult to put out and would also have produced a vast range of substances, many of which could harm the environment or human health." He added the mill had been "derelict for a long period of time" and would be converted into business units now the tyres have been removed.